Description This photograph shows the interior doors, ductwork and roof of the newly-constructed Alumni Hall. Notes Alumni Hall is one of the earliest pre-stressed concrete structures of this kind ever attempted. Engineering magazines from the time noted that the eleven 160-foot pre-cast arches used in the building's construction were a record-breaking span for pre-cast arch ribs used in the United States. 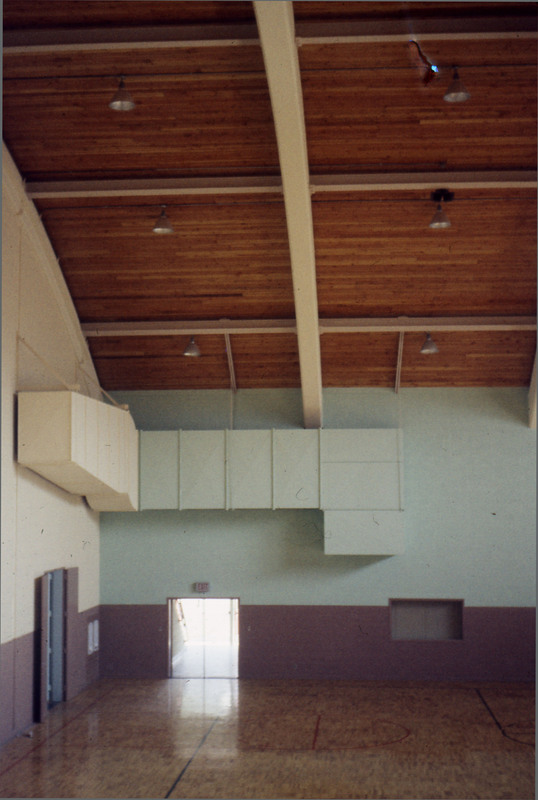 Originally the gymnasium had a dividing wall separating it into two sections. On the floor of Alumni Hall is the Fairfield University seal. Renamed the Alumni Hall - Sports Arena in 1981, the gymnasium is the home of the women's Division I volleyball team and the Office of Sports Information. This is one of a series of 34 color slides depicting the construction of Alumni Hall from 1958-1959. The slides have been digitized in chronological order to show the progress of the construction over time, and have the identifiers SL002327 - SL002360 respectively.